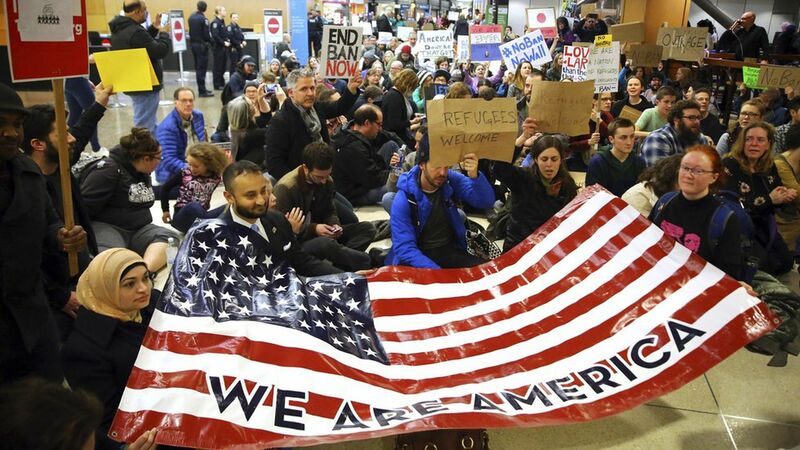 Trump faced an instant, searing global backlash for his executive order on refugees. White House officials say they expected resistance, but some administration officials were rattled last night by the scale, swiftness and decibel level of the blowback. Protests continued today. WH Chief of Staff Reince Priebus says this morning we "apologize for nothing": Priebus tells "Meet the Press" the situation yesterday "wasn't chaos." Green-card holders won't be impacted by the order going forward, but could face additional screening at CBP "discretion." Other countries could be added to order. We've found ten Republicans who criticized the order: Sen. John McCain warned it could be used as propaganda by ISIS to help recruit terrorists.Senate Republican Leader Mitch McConnell: "I think we need to be careful." White House on the federal judge's ruling, that barred deportations of people subject to the order would have no impact. "Nothing in the Brooklyn judge's order in anyway impedes or prevents the implementation of the president's executive order which remains in full, complete and total effect," White House adviser Stephen Miller told reporters.DHS statement: "President Trump's Executive Orders remain in place — prohibited travel will remain prohibited, and the U.S. government retains its right to revoke visas at any time if required for national security or public safety." Governments in Europe criticized the ban: A spokesman for the U.K.'s Theresa May, who visited Trump on Friday and hadn't commented during the day yesterday, told the AP May does "not agree" with the order. Democrats have an opening, after spending nearly two months back on their heels. Sen. Cory Booker of New Jersey showed up at Dulles airport, then tweeted last night: “I am driving North now from Virginia. I will check in on things at Newark airport tomorrow." Virginia Gov. Terry McAuliffe held a press conference on a concourse at Dulles, calling the order “ntithetical to the values that make America great. It will not make our country safer." @HillaryClinton tweeted: “I stand with the people gathered across the country tonight defending our values & our Constitution. This is not who we are." The numbers: A DHS official told CNN that there were 109 travelers barred from entry to the U.S. when Trump signed the order. The official wouldn't say how many were deported vs. detained. Lyft released a statement: "We stand firmly against these actions, and will not be silent on issues that threaten the values of our community."